The most common piece of bathing equipment is probably the bath seat. Bath seats are simply small seats or benches that sit in the bath tub and allow people to have a shower without having to stand or have a bath without having to sit right down into the bath tub. As with every other piece of home medical equipment, there are a variety of designs and models but all basically do the same thing. Bath seats come as adjustable height or not, with a back or not, padded or not and suction cups for tips on the legs or not. In order to use the bath seat the user simply steps into the tub and sits down. A model with a back is best for those whose balance is not sufficient to sit for periods of time without some support. Whether or not one buys a bath seat with a padded seat is really a matter of comfort but it should be considered for those who are very thin, have had any type of skin break down or are susceptible to skin break down or pressure sores. Standard Bath Seat - The standard bath seat is simply a plastic seat with four legs. It will usually work fine for many users who do not require any added support or a specific height of seat. Adjustable Height Bath Seat - The adjustable height bath seat is similar to the standard bath seat except that the four legs can be adjusted in length. It will usually work fine for many users who do not require any added support but do need a specific seat height for comfort or safe usage. Shower Stool - The shower stool is similar to the adjustable height bath seat except that it has a round seat instead of the standard rectangular seat found on conventional bath seats. The shower stool will usually work fine for users who do not need any added support and have good balance but may need some support while in the bath tub. 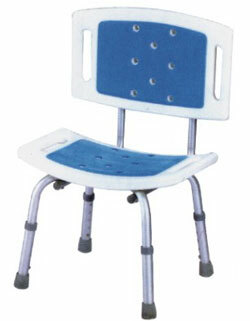 The pictured model has adjustable legs to allow the stool to be adjusted to the optimal height for the user. Bath Seat with Back - The bath seat with back is similar to the standard bath seat except that it has a back rest and, depending on the model may or may nor be height adjustable. The back on the bath seat with back provides some support for those who find sitting unsupported too difficult for the time it takes for bathing or showering. Padded Bath Seat with Back - The padded bath seat with back is similar to the standard bath seat with back except that the seat and back are padded to provide some pressure relief. This padding will be beneficial to anyone who is susceptible to pressure sores or is very thin and finds some padding to be more comfortable. The pictured model of padded bath seat has blue EVO padding that is a thin gel like material that is completely waterproof but other models are available that are padded with conventional foam and covered with a waterproof vinyl. The conventional foam may provide a bit better pressure relief but if the outer cover gets cut or damaged water can soak into the foam causing it to rot and bacteria to grow. Bath Seat with Arms - The bath seat with arms offers all the benefits of other bath seats except that it also has arms for extra support of the user. Choosing a model with removable arms will make transfers easier for the user but still provide the support needed while bathing or showering. The pictured bath seat with arms features an adjustable height seat, back rest and removable arm rests. Folding Bath Seat - Folding bath seats provide the same support as conventional bath seats mentioned above but will fold up for compact storage and easy transporting. Users who require a bath seat for showering and bathing will appreciate being able to take their seats with them when travelling. Depending on the model chosen, folding bath seats may or may not have adjustable height seats and/or back rests. Bath Boards - Bath boards are the most basic type of bath seat. They basically span the top of the top of the bath tub and are supported by the bath tub side walls. Bath boards are width adjustable and can be placed anywhere along the length of the tub that is convenient. Because they are basically a flat board and have no legs they can be easily stored away and transported but they do not have any type of back support or height adjustment.